1 All ye peoples, clap [your] hands; Shout to God with joyful cry. 2 For Jehovah is most High [and] dread, A great King over all the earth. 4 He chooses for us our inheritance, The pride of Jacob whom He loved. Selah. 5 God is gone up with a shout, Jehovah with trumpet clang. 6 Sing with the harp to God, sing with the harp: Sing with the harp to our King, sing with the harp. 7 For King of all the earth is God: Sing with the harp a skilful song. 8 God has become King over the nations: He has taken His seat on His holy throne. 9 The princes of the peoples gather themselves together [As] a people of the God of Abraham: For to God belong the shields of the earth; Greatly has He exalted Himself. The closing thought of Psalm xlvi. is nobly expanded in this jubilant summons to all nations to praise Jehovah as their King. Both psalms have a similar, and probably the same, historical basis: a Divine act so recent that the tumult of triumph has not yet subsided, and the waves of joy still run high. Only in Psalm xlvi. the effect of that God-wrought deliverance is principally regarded as the security and peace of Israel, and in this psalm as the drawing of the nations to obey Israel's King, and so to join the chorus of Israel's praise. 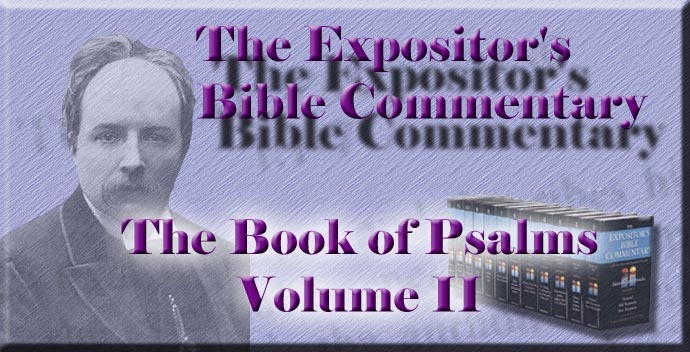 While the psalm has many resemblances to the Songs of the King (Psalm xciii. seqq. ), it is clearly in its right place here, as forming with the preceding and succeeding psalms a trilogy, occasioned by one great manifestation of God's care for the nation. No event is more appropriate than the usually accepted destruction of Sennacherib's army. The psalm has little of complexity in structure or thought. It is a gush of pure rapture. It rises to prophetic foresight, and, by reason of a comparatively small historical occasion, has a vision of the world-wide expansion of the kingdom of God. It falls into two strophes of four verses each, with one longer verse appended to the latter. In the first strophe the nations are invited to welcome God as their King, not only because of His Divine exaltation and world-wide dominion, but also because of His deeds for "Jacob." The same Divine act which in Psalm xlvi. is represented as quelling wars and melting the earth, and in Psalm xlviii. as bringing dismay, pain, and flight, is here contemplated as attracting the nations to worship. The psalmist knows that destructive providences have their gracious aspect, and that God's true victory over men is not won when opposition is crushed and hearts made to quake, but when recognition of His sway and joy in it swell the heart. The quick clatter of clapping hands in sign of homage to the King (2 Kings xi. 12) blends with the shrill cries with which Easterns express joy, in "a tumult of acclaim." Hupfeld thinks that to suppose the heathen called upon to do homage because of the victory for Israel won over them is entirely mistaken. But unless that victory is the reason for the summons, the psalm offers none; and it is surely not difficult to suppose that the exhibition of God's power leads to reflection which issues in recognition of His sovereignty. Vv. 3, 4, seem to state the grounds for the summons in ver. 1. The tenses in these verses present a difficulty in the way of taking them for a historical retrospect of the conquest and partition of Canaan, which but for that objection would be the natural interpretation. It is possible to take them as "a truth of experience inferred from what had just been witnessed, the historical fact being expressed not in historical form, but generalised and idealised" (Delitzsch, in loc.). The just accomplished deliverance repeated in essence the wonders of the first entrance on possession of the land, and revealed the continuous working of the same Divine hand, ever renewing the choice of Jacob's inheritance, and ever scattering its enemies. "The pride of Jacob" is a phrase in apposition with "our inheritance." The Holy Land was the object of "pride" to "Jacob," not in an evil sense but in that he boasted of it as a precious treasure intrusted to him by God. The root fact of all God's ancient and continued blessings is that He "loved." His own heart, not Jacob's deserts, prompted His mercies. The second strophe is distinguished from the first by the increased fervour of its calls to praise, by its still more exultant rush, and by its omission of reference to Jacob. It is wholly concerned with the peoples whom it invites to take up the song. As in the former strophe the singer showed to the peoples God working in the world, here he bids them look up and see Him ascending on high. "Now that He ascended, what is it but that He also descended first?" The mighty deliverance of which the triumph throbs through this trilogy of pæans of victory was God's coming down. Now He has gone back to His throne and seated Himself thereon, not as having ceased to work in the world--for He is still King over it all--but as having completed a delivering work. He does not withdraw when He goes up. He does not cease to work here below when He sits throned in His palace-temple above. The "shout" and "voice of a trumpet," which accompany that ascent, are borrowed from the ordinary attendants on a triumphal procession. He soars as in a chariot of praises,--from whose lips the psalm does not say, but probably it intends Israel to be understood as the singer. To that choir the nations are called to join their voices and harps, since God is their King too, and not Jacob's only. The word rendered in the A.V. and R.V. (text) "with understanding" is a noun, the name of a description of psalm, which occurs in several psalm titles, and is best understood as "a skilful song." Ver. 8 gathers up the reasons for the peoples' homage to God. He has "become King" over them by His recent act, having manifested and established His dominion; and He has now "sat down on His throne," as having accomplished His purpose, and as thence administering the world's affairs. A final verse, of double the length of the others, stands somewhat apart from the preceding strophe both in rhythm and in thought. It crowns the whole. The invitations to the nations are conceived of as having been welcomed and obeyed. And there rises before the poet's eye a fair picture of a great convocation, such as might wait before a world-ruling monarch's throne on the day of his coronation. The princes of the nations, like tributary kings, come flocking to do homage, "as if they surely knew their sovereign Lord was by." The obliteration of distinction between Israel and the nations, by the incorporation of the latter, so that "the peoples" become part of the "people of the God of Abraham," floats before the singer's prophetic eye, as the end of God's great manifestation of Himself. The two parts of that double choir, which the preceding strophes summon to song, coalesce at last, and in grand unison send up one full-throated, universal melodious shout of praise. "The shields of the earth" are best understood as a figurative expression for the princes just spoken of, who now at last recognise to whom they belong. Thus God has exalted Himself by His deeds; and the result of these deeds is that He is greatly exalted by the praise of a world, in which Israel and the "peoples" dwell as one beneath His sceptre and celebrate His name. The psalmist looked far ahead. His immediate experience was as "a little window through which he saw great matters." The prophecy of the universal spread of God's kingdom and the inclusion in it of the Gentiles is Messianic; and whether the singer knew that he spoke of a fair hope which should not be a fact for weary centuries, or anticipated wider and permanent results from that triumph which inspired his song, he spake of the Christ, and his strains are true prophecies of His dominion. There is no intentional reference in the psalm to the Ascension; but the thoughts underlying its picture of God's going up with a shout are the same which that Ascension sets forth as facts,--the merciful coming down into humanity of the Divine Helper; the completeness of His victory as attested by His return thither where He was before; His session in heaven, not as idle nor wearied, but as having done what He meant to do; His continuous working as King in the world; and the widening recognition of His authority by loving hearts. The psalmist summons us all to swell with our voices that great chorus of praise which, like a sea, rolls and breaks in music round His royal seat.